Soldier preparing his gear in a hangar. - Stock Footage, Inc.
Home Military Soldier preparing his gear in a hangar. Soldier preparing his gear in a hangar. Tags: adjust, adjusting, airplane, airport, anticipation, armory, army, backpack, bag, bags, beret, berets, buckle, camo, camoflauge, camouflage, chinook, force, forces, gear, glasses, green, guard, hangar, hanger, helicopter, helmet, male, Man, men, military, national, operations, pack, preparation, prepare, preparing, reserves, safety, soldier, soldiers, special, strap, suit, tan, training, uniform, wait, waiting, war. Soldier preparing his gear in a hangar with a CH-47 Chinook Helicopter in the background. From a training for Green Beret United States Army Special Forces. 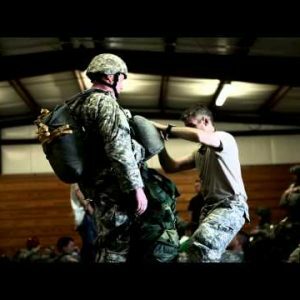 Soldiers preparing for parachute jump.